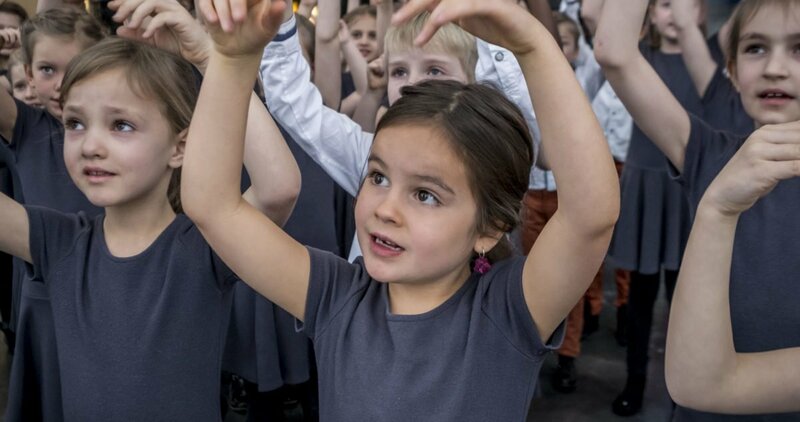 Almost 300 talented children and young people aged 6-22 attend the Danish National Choir School, which forms a musical food chain of choirs all the way from early school age up to the young singers in the Danish National Girls’ Choir. The choirs of the Danish National Choir School appear on radio and TV, in concerts and on CD recordings – often together with DR’s ’grown-up’ ensembles. The Danish National Choir School also has ear-training and solo singing lessons, and from the Junior Choir upward each student must play an instrument alongside the choral singing. The Danish National Choir School comprises four different choirs: the Danish National Sprout Choir, the Danish National Children’s Choir, the Danish National Junior Choir and the Danish National Girls’ Choir. The two youngest choirs are for both girls and boys, while the Junior Choir is an ’appren­­tice choir’ for the Danish National Girls’ Choir. As Principal of the Danish National Choir School and conductor of the Children’s and Junior Choirs, Susanne Wendt is an expert on children’s voices. She works in-depth with the sound of the choirs, among other ways by involving body and movement and by consciously cultivating singing pleasure in the children. You sing best when you’re happy. Besides the development of the children’s voices and musicality, it is important for Susanne Wendt and the Danish National Choir School to inspire other choir directors and con­duc­tors. This is why Susanne often teaches at courses and choir festivals across the country, and on DR’s media platforms you will find a number of videos that show how she works with among others the Danish National Children’s Choir. Susanne Wendt trained at the Royal Danish Academy of Music with further studies with among others Michael Bojesen, Alice Granum and Margrethe Enevold. With her special feeling for the youngest choir singers and her great experience from the Sankt Annæ Gymnasium, Clara Smedegaard is an important figure in the Danish National Choir School. She uses among other resources sol-fa, dance, play and movement when she needs to concentrate the attention of the very young singers. Clara came to the Danish National Choir School in 2014 after ten years conducting the Sankt Annæ Sprout Choir, which she herself founded. She trained at the Royal Danish Aca­demy of Music with among others Alice Granum and Michael Bojesen. Clara Smedegaard is the permanent conductor of the Danish National Sprout Choir and assistant conductor of the Danish National Children’s Choir.